$35,220. Base price $31,200. Base price was $31,200, and options included a V6 Pony Package, rear decklid spoiler, and front floor mats with the Mustang logo. Other options, in addition to the automatic transmission, were a comfort package, heated seats, seated mirrors with a pony lamp, a rear video camera, satin black tape stripe and a few other items, all of which brought the price to $35,220. 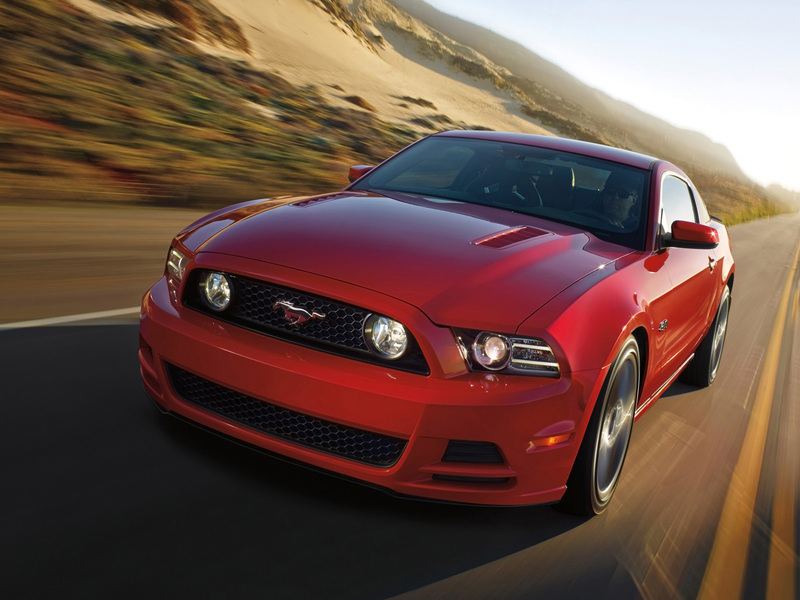 This 2014 Ford Mustang is performance-packed. That's due to the V6 'Pony Package', the 3.7 litre, 305 horsepower packaged engine and 6 speed transmission. Just put your foot gently on the accelerator and hold on tightly from there. To add to this, our model had a 6 speed select shift; give it a go with the top down. It's not even the most powerful Mustang you can buy but it sure is fast enough to cause some bulging eyeballs and some tingling hair on your head, shoulders and arms, thanks to the 3.7 liter, 305 horsepower V-6 under the hood, backed by a six speed automatic transmission. 30 highway and 19 city miles to the gallon - which is an improvement over the Dodge Challenger and Chevrolet Camaro; a feather in the Mustang's saddle- so to speak. The car is rated at 23 miles per gallon overall, and 19city/30 highway. Annual fuel costs are $2,300 a year based on gasoline costing $3.50 a gallon. The 2014 Mustang is not for the faint of heart... it's a fun to drive classic that has done a remarkable job of staying true to its blue roots while adapting new feature and new designs and new technologies into it. The Mustang is as hot and botched up as ever - wider on the angles and, our model came with the rear spoiler. The embossed "pony" was on the steering wheel, the floor mats, the grille, the trunk lid, the wheels, even at night it shines through the driver's door - nice touch. Leather sport seats with white stitching. This Mustang has an aged look and has a dire need to be contemporized-see more under "Aesthetics & Design". Having said that, it remains a terrific value in its class. All of our lovely, glowing memories that we've ever had of our time with Mustangs were apparent in the 2014 Mustang V6 Premium that we drove for a week recently. They were all there: the low position in the seat with that huge hood looming ahead, the low growl of the powerful V-6 engine, that familiar Mustang dashboard that's been around in one version or another for year after year, the outrageously gorgeous exterior styling, and that persona of all-American muscle that this car wears so well. It may be just the last of the authentic American car designs, right down to the way it's built. It will remind many of the older among us of what was -and what some believe we have lost in our race to better build quality, more European flavor inside and out, and of course, more sales and more catering to those who may not have even considered buying an American car up till now. And if you still want a piece of classic four wheeled Americana, you'd better hurry. An all-new Mustang from stem to stern will debut this spring, and though spy pictures show a car that doesn't look all that different from current Mustangs, it's certainly new enough to make this current model look and feel outdated. It even has an independent rear suspension-something guaranteed to stimulate discussion among the Mustang faithful. In any case, the current model we drove was a heck of a lot of fun. The current generation Mustang, in spite of its creature comforts, still exudes a sense of rawness and potential, as though its just waiting to cut loose right from under you. It's aptly named, that's for sure, with raw, muscled engine energy just waiting to gallop down the road. You feel every bump in the street, as well it should be as far as we are concerned. This is a high performance muscle car, not a family car. If a family car is what you want, you should buy one. Plenty of safety features include dual front and side airbags, LATCH child safety systems, Anti-theft system, Tire pressure Monitor, SOS post-crash alert system. Cap less gas tank. AdvanceTrac, SOS post-crash alert system, Anti-theft system, all sorts of airbags, etc. Heated mirrors, Rear video camera, ambient lighting, Shaker Audio System/AM/FM/ Single CD/MP3/Sync Voice Activated System, Sirius Satellite, Power Steering Windows. Standard equipment included LED sequential tail lamps, stainless steel dual exhausts, variable interval wipers, HID projector headlamps, leather sports seats, six way power driver's seat, center console, air conditioning, a shaker audio system, Sync voice activated system, full power accessories including power steering brakes, windows, etc. AdvanceTrac, dual front and side airbags, SOS Post Crash alert system, and other items. What's our issue with the current model? It looks outdated visa vi its competitors; the components on the dash look made of cheaper plastics, the dials look older. It's time for an over-haul using the inspiration of the timeless transport. What can I say? It's classic Mustang, baby! Cool, cool, cool! Bumper to bumper is 3 year/36,000; Powertrain is 5 year/60,000 mile; and a Roadside Assistance Warranty is 5 year/60,000 mile. Basic warranty is three years or 36,000 miles bumper to bumper, a five year/60,000 mile powertrain, and a five year/60,000 mile roadside assistance warranty.